CHOOSE YOUR BASE. Water is always a good way to start. Then add vegetable, chicken or beef broth. If you are watching your sodium intake, use a low-sodium broth. Other flavors to brighten up your base are light coconut milk, soy sauce (or liquid aminos) or clam juice. CHOOSE YOUR NOODLES. 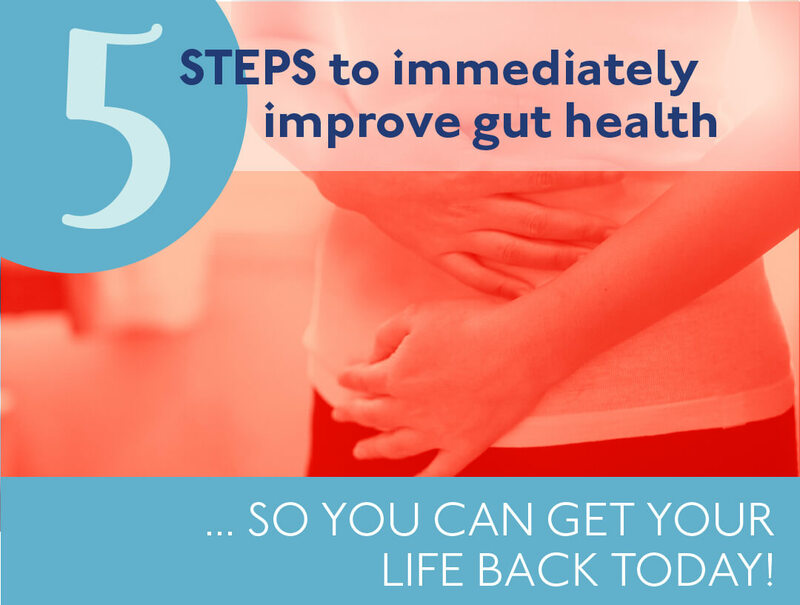 Do you suffer from gluten intolerance? If so, then try rice or buckwheat noodles. 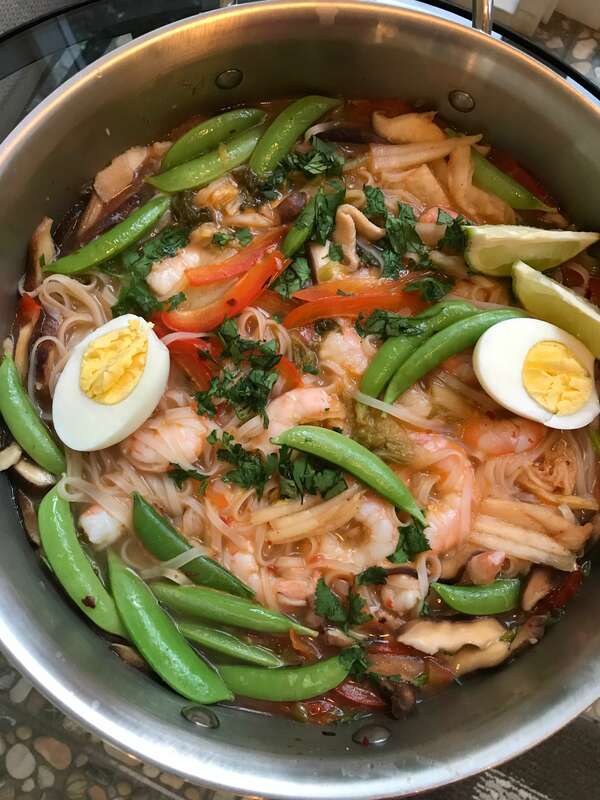 I love rice noodles, not only do they cook quickly, they are a little different from your typical pasta noodle and just give a different vibe. If your body tolerates gluten no problem you can use a wheat spaghetti noodle or a ramen noodle. CHOOSE YOUR PROTEIN. I think shrimp pairs nicely with Asian food, but you can choose anything your heart desires. It’s so easy to make your noodle bowl vegetarian if that is what you desire. Try tofu, or edamame. Did you know that edamame is considered a high quality protein source because it contains all 9 essential amino acids our bodies need and for an added bonus it’s full of fiber. Maybe you just add 2 hard boiled egg slices versus one and call it good. If you don’t want to go vegetarian that is A-ok, add some beef, pork or chicken. CHOOSE YOUR VEGETABLES. In this recipe I used red bell pepper, snap peas (but recommend snow peas instead), and shiitake mushrooms. I love shiitake mushrooms! There are so many fun vegetables that you can use to make it your own. As a result of using a variety of vegetables you will pump up the nutrition in your noodle bowl. Try napa cabbage, purple cabbage, spinach, kale, baby bok choy, carrots, celery, white onion, bamboo shoots, bean sprouts or kimchi. Adding a fermented food at the end of cooking, right before serving is a great way to get some probiotics (good bacteria) into your diet! You see, so many choices. CHOOSE YOUR FLAVOR. Using ginger when you can is an excellent choice. Ginger has powerful anti-inflammatory properties that your body loves and the flavor is so unique. Get creative and try some of these magnificent flavors; cilantro, garlic, miso, peanut butter, sesame oil, rice wine vinegar, fish sauce or curry paste. If you want to add some fire or sass try siracha sauce, garlic chili sauce, red pepper flakes or some type of spicy chili like jalapeno. How easy is this, just 5 easy steps! Do you believe me now when I say creating a noodle bowl can really step up your nutrition game? Not only will you be proud of the dish you just created but most of all your eyes and taste buds will be delighted by all of the beautiful colors and blended flavors in your dish. I’d love to hear from you. Drop me a comment below and tell me what you think of your next noodle bowl. Remove shrimp tails, set aside. Combine shrimp tails, water, broth, clam juice and ginger in a small saucepan; bring to a boil. Reduce heat, and simmer, uncovered, 10 minutes. Strain broth through a tight-knit strainer to remove solids and discard. Heat olive oil in a medium - large saucepan, over medium to high heat. Add bell pepper, scallion, shiitake mushrooms and garlic; sauté 3 minutes or until vegetables are soft. Add reserved broth; bring to a simmer. Add shrimp, snow peas, chili garlic sauce, red pepper flakes, salt and noodles; cook 5 minutes or until noodles are done. Add 1/4 cup kimchi at the end and stir. Ladle 1 1/4 cups soup into each; into 4 bowls. Top each serving with cilantro, 1/2 of a hard boiled egg and a lime wedge. You can decrease or increase the spicy flavor in this soup. If you would like it less spicy do not use the red pepper flakes. If you would like it more spicy use both the chili garlic sauce and the red pepper flakes. You may just need to start with small amounts and taste as you go to keep checking the heat of your dish if you are concerned with too much spice. Thank you Melissa! It was very yummy. Can’t wait to try another bowl. Pretty sure this should be a CWM recipe soon!! It looks SO tasty! Great Idea! It was yummy. I made it so long ago…it seems like. Previous PostPrevious Weight and Wellness, is it for you? Next PostNext Is stress making you sick?